The kitchen is the heart of the home and should reflect the way you live your life. A remodel is a big decision and requires a lot of thought, you want a functional kitchen for yourself but also one that will appeal to buyers should you decide to sell in the future. A kitchen remodel is a large investment. Ranging anywhere from $10,000 to $50,000, the national average for a kitchen remodel is $22,000. A smaller project between $10,000 and $15,000 may include painting walls, refacing cabinets, upgrading the sink, and installing a tile backsplash. A $30,000 plus renovation may include installing custom cabinets, hardwood floors, granite countertops, and high-end appliances. The first step in determining kitchen renovation costs is to consider your kitchen as a whole. What do you want from your kitchen? How do you want it to look and function? Is the size and configuration right? If you are remodeling the kitchen for yourself and plan to live in it for the next decade or longer, you will most likely want to splurge on a few luxury items that you want but will also add to the resale value of your home. When my friends recently remodeled their kitchen, they splurged on a high end range and hood. They spend a significant amount of time cooking and wanted a true chef’s kitchen in their home to enjoy. If you spend a lot of time in the kitchen and have dreamed about a 6 burner range, go for it! Spending money on high end appliances is never a bad idea. They add value to your home and are features buyers look for when considering a home purchase. Another appliance to splurge on is the refrigerator. My recommendation is to get a refrigerator as big as possible for your kitchen. If you have to remove some cabinets to make space for a larger fridge, I suggest doing so. Who wants to run around the house and into the garage to find the auxiliary fridge to get a soft drink or some frozen meat? Aim for 1 refrigerator in the home. You don’t have to chose a fancy brand, just the largest size. I also recommend choosing stainless steel for appliances and that is what buyers look for in a home as well. Definitely spend more when it comes to choosing a countertop for your kitchen. A stone countertop costs more than a laminate one but is worth the extra cost. Whether you choose granite, quartz, soapstone, or travertine – aim for a natural stone over a laminate. There are ways to save in this area if you want the beautiful surface on a budget. For instance, there are assorted grades of granite (rated 1-5 on various scales). Rather than going for a grade 5, consider a grade 2, where you’ll get a better return on investment. Another way to save is to choose a remnant piece of granite with a beautiful pattern which will make a grand statement in our kitchen. A veneer cabinet next to one that is solid wood is not distinguishable to the naked eye. Cabinet sides and shelving should be made from plywood, not particle board, plywood is a good choice for resale and is a strong material. The cost of custom cabinets in through the roof and adding extras like drawers, roll-out trays, extra shelves and extending cabinets to the ceiling are very nice options to have but will add to the price tag. Instead of opting for high end cabinets, invest in cabinets with soft close drawers and doors, which has evolved to a “must” for convenience and resale. Splurge on functionality! Also, consider relocating your microwave to a less conspicuous space like under the counter and don’t try to save on installation, let a professional take care of that, it’s not as easy as you might think. Knobs, pulls and handles refresh the look of an entire kitchen. But the price of hardware ranges drastically anywhere from $1.25 a pull at a home store to $100 or more from a custom designer. If you want to save extra money, choose the same type of pull you already have—switch knobs with knobs, and pulls with pulls. As for finish, you can update the look of your kitchen by trading your current hardware for brass, pewter and other time-worn, aged-looking metals. Don’t worry if your faucet is stainless steel and your drawer pulls are bronze. It’s not necessary to match all of your metals, some variety makes the kitchen more interesting. A terrific low-cost alternative to natural stone, is to choose a porcelain tile for the floors. Porcelain tile resists chipping and cracking, and is a favorite for budget and longevity. Consider large tiles for flooring, or porcelain tiles that look like hardwood flooring which give the kitchen an updated look and require fewer grout lines and cuts during installation. Another budget friendly option on flooring is to purchase a porcelain tile that looks like natural stone. When it comes to choosing a backsplash, ceramic tile is a nice option. Or consider a glass-tile mosaic for a backsplash, just space them out in the design or it can look too busy and you’ll push up the price of installation. My friends chose this beautiful glass backsplash for their kitchen remodel. The glass tiles really add to the overall design of the kitchen and the subway installation creates a classic and timeless look. Kitchen remodeling is a big decision but whatever your budget, making the right choices will add years of enjoyment for you, and will add value to your home in the long run. 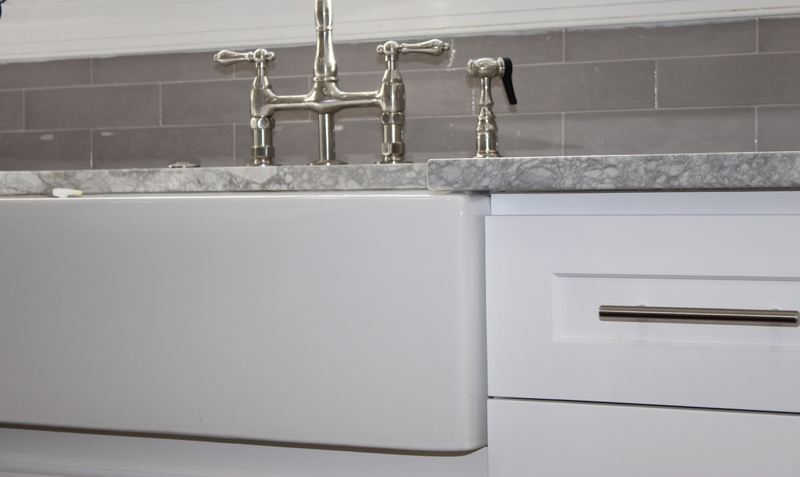 Another tip I have for kitchen remodeling, which adds function, style and value to your home is to add a farmhouse sink. You can’t go wrong with this style sink and the classic design fits in any home. Read more about that HERE. Want to see another kitchen renovation, check out our recent budget friendly kitchen renovation HERE, we painted our cabinets, changed the hardware and added new lighting. For more home interior remodeling tips, subscribe to Happy Haute Home and follow along on Pintrest HERE, and Twitter HERE and feel free to pin and tweet your favorite pics from Happy Haute Home. As somebody who just remodeled our kitchen, I 100% agree with all of this!!! We are ready to start a fairly extensive kitchen remodel in mid-August when we return from vacation. I took to heart what you said about Farm Sinks in your previous post. Luckily, I have found and purchased the perfect sink. Thank you for the suggestion. On the other hand, we will have the added expense of replacing the granite counter tops because of the poor choice in color I made six years ago. I am trying to give more attention to detail this time. Glad you found the post helpful, thanks for visiting. My husband and I just remodeled our kitchen and we 100% agree with your recommendations! We just replaced the cabinet doors (and painted them ourselves) and saved TONS! We also found some extremely affordable knobs online and a great deal on tile at a local store! That’s wonderful! A little hard work goes a long way. We have painted many cabinets as well, completely changes the look of the room for a small fraction of replacing. Thanks for stopping by.. I love the subway tile in this one… do you happen to know more specifics – where to buy, etc? Thanks! I don’t have the specifics for that kitchen but subway tile is very common, even Home Deport has a nice selection of different sizes in white. Glad you like it. “Spending money on high end appliances is never a bad idea. ” I call BS on that. You don’t need to bury yourself in debt for a Subzero when a Kitchenaid will do the trick. It’s not about the brand names, and encouraging people to spend spend spend isn’t the answer. Sure I’d love to have a French door wall oven, But ultimately I would rather put that money towards a new roof on my house. I’d also recommend folks consider more sustainable options when remodeling as there is a massive environmental impact to the money with all new everything. We built all of our base cabinets from repurposed wood and not only did it cost us nothing but it looked 10 times more beautiful than the chemically laden materials that most countertops and cabinets are full of. The purpose of the post is more about what is important to you to have in your dream kitchen. And if having a WOLF is something you have always dreamed about, then go for it. The range will definitely add value to the home. Of course, we should consider the monetary ramifications of the purchase and weigh options when considering home improvements. Absolutely I totally agree with that!! Thanks for visiting.